Kathy Powers is a National Board Certified reading and language arts teacher at Carl Stuart Middle School in Conway, Arkansas. She has 20 years of teaching experience in first, fourth, fifth, and sixth grades, and in almost every subject. Powers has authored articles in education journals, presented at several conferences including the International Reading Association conference, and has been awarded multiple educational grants. In 2011, she was named the Arkansas Teacher of the Year. In August of 2012, Powers was named a National America Achieves fellow, and will be traveling to talk with national education policy makers over the course of the next two years. Although I have seen many changes happen over my 20 years as a classroom teacher, Common Core is the most seismic shift I have seen to date. As a middle school literacy teacher in Conway, Arkansas, I taught using Common Core standards this year for the first time. This blog is my view from the core, and hopefully it will help make your transition to teaching with common core standards much easier. How is teaching literacy different under the Common Core? 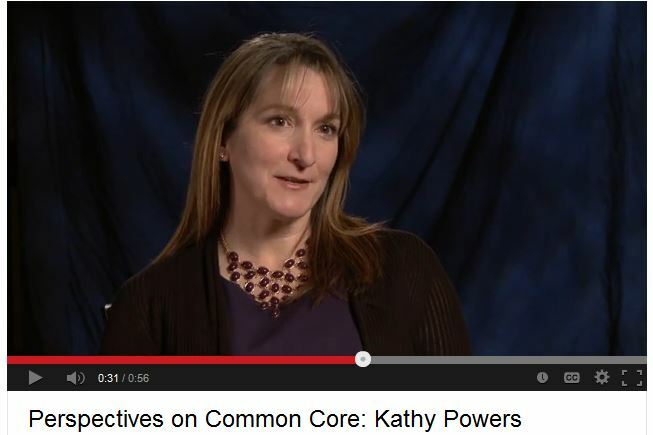 How is teaching math different under the Common Core? Globally Competitive Students: In a competitive world, Arkansas students need and deserve to be challenged in the classroom in order to compete with their international peers on a global level. The recently released results of the TIMSS test (Trends in International Math and Science Study) show that although we are doing better; American students are close to the top in literacy, but still middle of the pack in math and science. http://www.brookings.edu/research/reports/2013/03/18-timss-pirls-scores- loveless One of the causes of our mediocre international performance is attributed to the fact that higher performing countries teach a smaller number of standards at a deeper level, while American educators are expected to cover it all. Common Core addresses that issue. There are fewer standards allowing teachers more time to teach each standard at a deeper level. I found Common Core Standards instruction to be very challenging for both myself and my students. Early Rigor: One of the goals of the CCSS is to educate our children to graduate ready for success in College or a Career. The rigor of the standards begins in kindergarten and builds through 12th Rigorous early instruction is vital in meeting meet this goal. However, I think kindergarten is not early enough. Our state must recognize the need for a state-wide, QUALITY pre-Kindergarten program for every child in Arkansas. If we are serious about getting our students college-and-career-ready and closing the academic achievement gap in our state, we must to start before kindergarten. Crowd Sourcing: The Common Core State Standards have been adopted by 46 states to date. That fact has provided teachers with the opportunity to crowd-source using modern communication resources such as internet chat rooms, lesson share sites, and social media sites. Now that most of us share a set of common curriculum standards, teachers all over the country can share ideas for how to better teach our students with the CCSS. Cart Before the Horse: Some teachers became frustrated by the time table of Common Core implementation in Arkansas. Many teachers were required to start teaching with the Common Core standards without having received any PD on HOW to teach with the new standards. I have talked with teachers from other states with similar experiences. Where is the “HOW?” Many of my fellow teachers and I understand the need for more rigor and challenging our students to help them achieve. We get it. What is lacking is the “how.” How is teaching with the new standards different from teaching with the old? Video examples with attached resources to print would be so useful. There are now some video resources out there (see the list of resources below), but it would have been nice to have those in place BEFORE we were required to teach with the CCSS. Teach the New, But Test the Old: One of the biggest problems teachers are experiencing with common core implementation in Arkansas is the fact that we are now teaching with the new CCSS, but our students are still being tested over the old state standards. This will result in a dip in test scores and a dip in parent and public support for CCSS. So although this problem will go away when Arkansas shifts to the PARCC assessment in 2014-2015, it is still a big headache for teachers now. Mythinterpretation: Yes, I created a new word. I could not decide if this section should be called “Myths” or “Misinterpretation,” and as an English teacher subjected to words like “ginormous” from my students, I think I am entitled to create one of my own every once in a while! Myths: There are several myths associated with the CCSS, especially in Literacy: no more fiction, no poetry, content teachers have to be grammar teachers, to name a few. Misinterpretation: At this point, the problem is not a lack of information on Common Core, it is that teachers are flooded with information and EVERYTHING seems to be labeled common core, whether or not it really is common core. Some teachers are being subjected to strange curriculum programs that are being called common core, but are not. The Common Core State Standards are unfairly being blamed for many unsuccessful district instructional programs, several of which were not common core, but are being labeled as such. I would encourage teachers to go to the source: www.corestandards.org or other reliable sources such as the ADE http://www.commoncorearkansas.org/and read about the standards for themselves.